51% of people now prefer to shop when businesses promote products online. 80% of people have purchased something this month. The people are there. They want online products. You see the opportunities. But the challenge appears when you try to promote products online. The competition is intense and often global. You have huge names like Amazon to contend with. As the competition heats up, ad costs rise. Finding the method that’s right for you and your business is the difference between paying unsustainable acquisition costs and making a profit in the ecomm marketplace. The more aligned your digital marketing methods are the better ROI you’ll achieve. That’s regardless of the competition. Let’s explore the best ways to promote products online and look at which ones will benefit your business. Social media advertising and ecommerce go hand in hand. 52% of product sales can be attributed back to Facebook. Around 75% of a buyer’s touch points with a brand they buy from take place on social media. A Nuestar case study showed that Pinterest ads are 30% more effective than other display ads with 5x the sales. It delivered a stunning 28:1 ROI. But is Facebook, Pinterest or another platform right for your brand, audience and products? Let’s take a look at each. Are you considering Facebook ads? Here’s what you need to know. 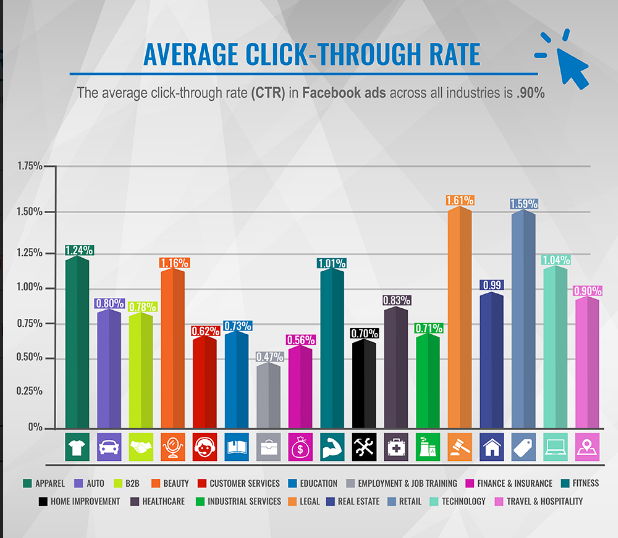 A Facebook average cost-per-click (CPC) is about $0.40. With a cost that low, you can promote products online for as little as $10 a day if you have a decent conversion rate. Your costs can increase depending on certain factors. It’s important to consider them to get the most out of Facebook advertising. First, the CPC may be higher if you sell in certain countries. 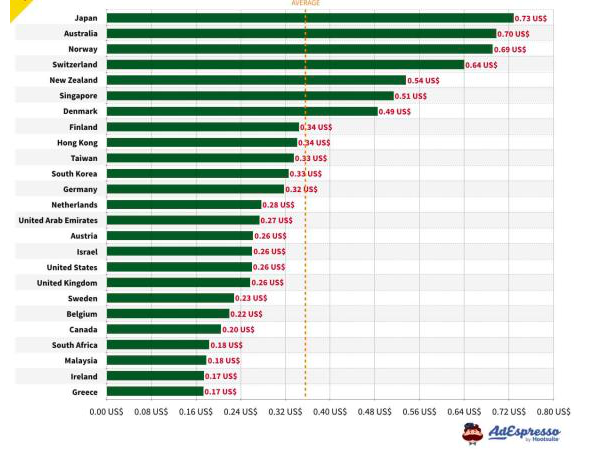 This Adespresso chart shows that the average CPC in Japan is $0.73. If you market in Greece, it could be as low as $0.17. This is 2016 data so this has gone up a little bit in the past couple years. Second, consider the time of year. Just think about how many more ads you see for certain types of products before Valentine’s Day, Halloween or Christmas. If you’re trying to tap into a seasonal market, you can expect costs to be higher. As a whole, you’ll spend the most money on any social media ads from October to December. Third, costs are also impacted by the age you’re targeting. Targeting users ages 45-65 actually costs more. That’s not surprising since this age group often has more money to spend. Fourth, the time your ad appears impacts the price. Costs tend to go up in the early morning when people are checking Facebook before work and then evenings after standard work hours. But this varies depending on what you’re selling. Some products have a typical time slot. For example, most people are thinking about dinner in the late afternoon. This is when a time-sensitive ad is most likely to be clicked. It’s the best time to show your ad in terms of conversions. But it’s also the most expensive. In the example below, the meal service Blue Apron is running their ad at 4:30pm, just before dinner time. This ad is costing them more than it would at 10pm or 6am, but they obviously find the cost to be worth the benefit for that prime-time slot. Placement of the ad can also drive your cost up. If you want an ad to appear in the news feed or Instagram expect to pay more. That’s because you’re going to get more attention in these locations. And finally, you typically pay more if your product is primarily purchased by females. As a very broad demographic, it’s simply more competitive to reach women. More businesses are marketing to them. It’s important to understand what’s driving your CPC up. You’ll find that these and similar factors increase your ad spend on every social media platform. Pay attention to what your analytics tools are telling you to keep costs low while making more sales. Your expected click-through-rate (CTR) is about .90% but some industries do better than others. Facebook is really good for any kind of legal or uncontroversial product or service. Almost 1.5 billion people log in every day. Their interests and purchase behaviors are broad. Not surprisingly, tech, retail, apparel, beauty and fitness get the most clicks on Facebook. When crafting creatives, keep text under 20% of the ad space. This isn’t just a rule on Facebook. 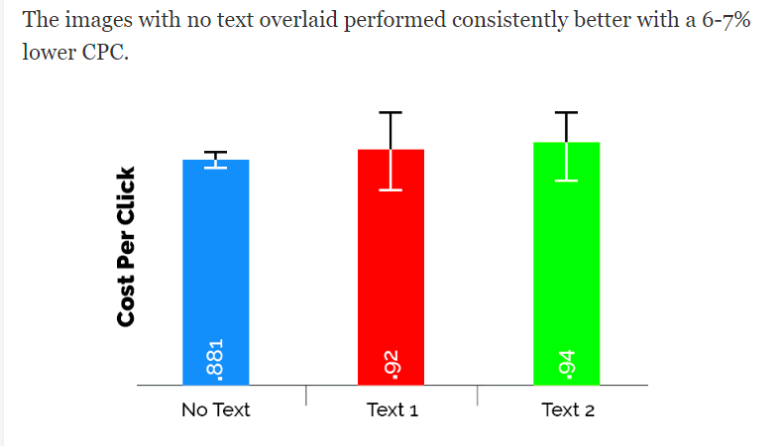 Ads actually perform better on social media with less text. Facebook wants your ads to perform well. That’s how they get paid. Your Facebook ads appear in news feeds. Therefore, the more “not like an ad” the ad looks, the better it performs. Less text helps accomplish this. Instagram ads work off the Facebook ad system. So refer to the Facebook section above for most details. And here’s what you need to know specifically about Instagram. Instagram ads cost more. You might average $1.41 for a click. But in the US, paying close to $4 in some industries isn’t unheard of. If you opt to pay for cost per 1,000 impressions, that averages around $8. Paying for these views may be beneficial when you’re launching a new brand and need to increase awareness fast, focusing on sales later. The average click-through-rate on Instagram is 0.52%. That’s much better than most display ads. But less than Facebook. Conversion rates, however, tend to be higher than Facebook. People like to engage and buy on Instagram. Interestingly, if the person who clicks is on an Apple product, your costs go up. Remember, it’s all about the competition and the potential return. 62% of ecomm purchases are mobile. Apple holds the monster share of this buying behavior with iPhone. On top of that, a Business Insider report released just this week stated that owning Apple products is the #1 indicator of personal wealth. More wealth = more money to spend on your products. That is if they didn’t break the bank buying that $1,000 iPhone. There’s a secret to getting lower rates on Instagram. January-March the CPC average tanks to under a $1. This is a great time to do a push to increase brand awareness that you can then take into maintenance mode once the costs go back up. 35% of Pinterest users are women making over $75k a year. Nearly 70% are making at least $50K. 10% make over $100K. This puts most Pinterest users in a solid middle to upper-middle income bracket. This makes Pinterest the place to market higher priced and designer products to this demographic. 62% of users are millennials and younger gen Xers (25-40). 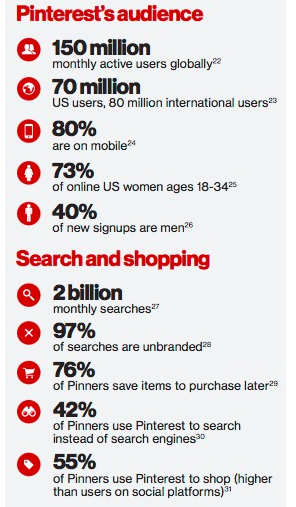 Add to this the fact that 76% of users pin items because they want to purchase it later. And 55% use Pinterest primarily to shop. Pinterest has the potential to drive a lot of traffic to your site. If you need to promote products online that cost over $80, your brand needs to be on Pinterest. But unlike Facebook and Instagram, where you target by selecting traits, Pinterest is built around keywords (similar to Google). You’ll need to do some keyword research to advertise on Pinterest. Know what people are searching for. What phrases do they use? Pinterest works on a cost-per-click system similar to Facebook and Instagram. You can bid as low as $0.10 and the CPC can vary a lot. Watch your campaign closely and adapt to keep costs low. When you promote products online using Pinterest, the average traffic increase is 30% with revenue increases of 200% – 300%. If the above-mentioned demographic is your potential customer, Pinterest is the place to promote products online and make sales. Regardless of which of these social media platforms you decide to use, you need to get the most out of your ad budget. If you don’t they’re not the “best” for you. So here are some quick tips to help you keep costs low while making more sales through these platforms. The cost per click or per impression isn’t the only cost involved. Someone needs to build the creatives, write copy and manage the campaigns, among other tasks. Social media ads need ongoing maintenance. Get the costs written down so you don’t overspend. Instagram and Facebook give your ads a relevance score. It’s like the Quality Score in Google Ads. If your ads don’t seem relevant to the users who see it, they will start charging you more and showing ads less often. On average, you’ll pay $0.15 more per click and get 75% fewer clicks when the ad is deemed irrelevant. To understand relevance, consider this graphic from the automation software company HootSuite. It goes from least to most relevant left to right. Do you see why? Use Facebook’s ad set up tools to narrowly target the right audience when you promote products online on both of these platforms. This not only helps you reach the right people. It also cuts down on the cost of mis-clicks. You’ll make more online sales for less when you use targeted ads. Pinterest also has a relevance score type system that’s driven by “Pinnability”. It’s less defined and continually being refined. To be relevant on Pinterest, design a creative people want to pin. Watch how people respond to it. Make changes to optimize and gain more visibility. Products that make an awe-inspiring visual are more likely to get shared. You’ll get more clicks. If you’ve taken steps to increase your conversion rate, this translates to more sales. Now, your ad looks like a personal recommendation from a friend. Whatever you’re selling, use imagery to evoke emotion. Earn those shares. A landing page isn’t your home page and it’s not a product category page. In ecommerce, your landing page is most often the page where the person can buy the item you advertised by clicking an “add to cart” or “buy now” button. Facebook and Google actually look at your landing pages and factors this into your relevance score. Create that seamless journey. You’ll have a higher conversion rate. You’ll see your costs go down. Social media advertising on Facebook, Instagram and Pinterest are 3 of the best ways to promote products online. Next, let’s look at Google ad network to see the best ways to promote products online and make sales with their platform. There are many options when advertising through Google. Here are some of the best for ecommerce. These ads give you a visual presence in Google search results among what is normally a page of text. If you have a product that can make a strong visual impression, the ad space is worth the cost. These ads also appear on Google’s affiliate websites (Google Display Network) giving you maximum exposure. To use Google Shopping Ads, take some extra steps. Signup for a Google merchant account. Share some product information with Google on a spreadsheet. And set your ads up in Google Ads. You only pay for the ad when someone clicks. The costs for that click average just $0.76. That’s compared to nearly $3 for a text ad on search ad. The click-through-rates (CTR) average 1.34%. Businesses using Google Shopping Ads are seeing revenue increases of 25% or more. This can be attributed to the power of the visual. The CTR and conversion rates tend to be lower on these ads. That’s reflected in the cost. But visual ads have a more residual effect. You’re increasing brand awareness and generating revenues well down the line even if the person did not click. Google has a long list of interesting items they won’t promote. Here are a few. A remarketing ad is a type of Google Shopping Ad Google shows on their Google Display Network after a person has visited your website. Google puts a cookie on the visitor’s computer using Google Analytics. It can then trigger the ad. You’ve probably seen these over the past couple years. They’ve become frequent because they’re very effective when you’re trying to promote products online. When people recognize a website they’ve recently left, they’re more likely to go back. That’s 400% more likely according to Adobe research. This is huge if you consider that the cart abandonment rates average over 75%. Additionally, 96% of people visit a website at least twice before they buy. This leads to lost sales unless you intentionally bring people back around to finish what they started. Remarketing gives you that second chance you need to make that sale. 43% of businesses are using remarketing to increase brand awareness. Repetition is important in marketing, as you know. After visiting your site, they’ll see the ad for a couple days on multiple websites that have agreed to show Google’s ads. 11% are using it to steal a competitor’s customers. Yes, you can remarket based on whether they visited your competitor’s website as well. You can also use it for upselling. Maybe they completed the sale. Now show them other items they may like through remarketing. On top of all of this, most people like remarketing ads. They just got distracted. You made it easy for them to come back. Marketing fatigue is when people get tired of a certain advertiser’s ad. Studies show that it takes twice as long for people to experience fatigue with remarketing. You might expect these ads to cost more given how effective they can be. But they’re not that much more than regular shopping ads. They average $1 per click. That’s less expensive than most text ads that appear in search results. This is definitely one to consider regardless of what products you sell. It supports all of your other promotion efforts. The thing about all of the visual ads we’ve been discussing is that they each allow very little (if any) text. Sometimes that’s a problem. In various cases, visuals are less impactful. A picture is supposed to be worth a thousand words. But sometimes 15-20 words is worth more. Do you need to describe the value proposition of something? Are people unsure why they need it? In these cases, regular search text ads are the best way to promote products online. Text ads appear when someone searches for a keyword phrase like “DIY Hydroponics Kit”. If you’re selling one, you may want your ad to appear when someone is searching for one. Text ads are more expensive. When done effectively, they have a higher conversion rate than the average shopping ads or social media. The ROI is definitely there. But you may experience sticker shock as you’re paying for clicks that don’t convert, especially in the beginning. You can expect to pay $3 per click (or more) for a text ad when selling products. Similar to social media, Google’s ads are only the way to promote products online when you apply effective strategies to maximize your ROI. Let’s take a look at that next. Here’s how to keep costs low on Google’s ad network. Pay attention to the Quality Score. You’ll pay more if you let it slip. Facebook will slowly stop showing your ad if it’s not relevant. But Google will keep showing it while you pay exorbitant prices for the clicks. Achieve a score of 10, Google gives you a 30% discount on your ads. Let it fall to a 1 and Google will charge you 600% more than they charge your competitors. That could mean you’re paying $18 for a click. The competition is paying $3 and their ad is ranking above yours. You can’t make a profit like that. To run a Google ads campaign effectively you have to take some time to research what keywords to use. Look at what the competition is targeting. Try to target words that are less competitive but still relevant. If it’s the perfect keyword it may be worth paying $4-5 for a click. But don’t let that ad spend get out of control. Use Google Keyword Planner to get suggestions. Don’t forget to research negative keywords. These are words people could use with your keyword that suggest they want something very different. If you sell “designer baby clothes” you don’t want someone who types in “free baby clothes” to pull up your ad. “Free”, “Charity” and “Discount” are all examples of negative keywords you may not want associated with your brand. The words “Sewing Pattern” might also be negative. It suggests a very different intent. The keywords you target should align with the ad copy. Targeting keywords that poorly align will lower your quality score. For example… You’re targeting the keyword “Men’s Tank Tops”. Your ad copy shouldn’t talk about women’s and kid’s tank tops. It looks like the ad is out of place. Put yourself in the searcher’s shoes. Would you click that ad? The landing page should align seamlessly with your copy. The copy offered 20% off. They should clearly see how to redeem it on the landing page. Otherwise, they’ll back out. That also will lower the quality score. But when you create an alignment, that score goes up. You save money. Ad campaigns require constant vigilance. Pay attention to what the data is telling you. Test your ads to maximize results. Get better over time. See costs plummet while conversions skyrocket. Want to know how to make real profits and grow your business? Think long-term. Retain customers by giving them a reason to come back and staying top of mind. Increase customer lifetime value through email marketing strategies. If you can get a customer’s email, you have the potential to achieve a 48:1 ROI by sending the new customer relevant content, ads and remarketing emails. Increase referrals, reviews and other promoter activity through social media marketing and email marketing. Improve visibility in places you don’t have to pay for a click. That includes organic search results through SEO and social media platforms with social media marketing. Together, these are the best ways to promote products online and keep those sales coming in. Promote Products Online. Increase Sales. There are many ways to promote products online. But finding the best ways not only means finding the right platform. It means learning how to maximize your results. Regardless of which method you use, strive to stay relevant. You’ll always out-perform the competition. Realize that ad campaigns take continual monitoring and improvement to get the best return. Test. Analyze. Make it better. Our digital marketing agency specializes in promoting products online in using various different channels. Contact us for your free consultation to see which platform is best for your business. Fantastic article to read. Very clear and concise. In addition, blog marketing can help to get a product more online visibility too. It helps drive traffic to websites and convert them into leads. One can claim establish and authority by creating helpful content for his perspective customers. Now blog posts play a vital role to rank in search engines.